Home / Girls Sports / Basketball / Girls Basketball: Head Coach Kristi Kaniewski Ulrich makes school and program history. Girls Basketball: Head Coach Kristi Kaniewski Ulrich makes school and program history. Kristi Kaniewski Ulrich, head coach of the girls basketball team, has once again made her mark in school history by becoming the most winning-nest coach in program history. 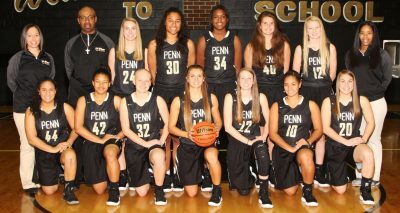 Ulrich, who led Penn to the 2016 Class 4-A State Championship, became the all-time winningest coach in Penn Girls Basketball history by picking up her 186th Kingsmen victory when Penn beat Jimtown, 78-12, on Dec. 1. Ulrich is in her 11th season. She topped the previous Penn coaching victory record once held by coach Dominic Ball, who had 185 wins as a Penn Girls Basketball Head Coach. Over the years “Coach K” has made an incredible impact, not just on how this program is run, but on the players and staff inside of it. She credited players, coaches, administration with their support, her family, and her husband Jimmie. Coach Ulrich said that she and the Kingsmen didn’t have time to dwell on the accomplishment. Coach Ulrich said that she appreciates the opportunity to guide the Kingsmen.